When we left California wine country, we knew it was time to head home. While we hadn’t seen or done everything that we wanted too, we were ready to spend some time with our family. Nick studied the map and proposed that we take I-80, a route that crosses through the heartland of our beautiful country. My research indicated that we would not find much to do or see on Route 80. But it was still too hot to take the southerly route, and there was no sense backtracking over territory that we’d already seen up north on I-90. Route I-80 made the most sense. Our first stop on Route 80 was Reno, Nevada. We pulled into the casino campground at the Grand Sierra Resort in the early afternoon. The campground was just a dirty parking lot, but we had access to all of the resort amenities at the casino/hotel. Nick and I cranked up the air conditioning in Arvie (the RV) for Bella, put on our bathing suits and headed to the pool. And what a pool it was! The pool-side bars and the music created a party atmosphere. The crowd was young and they were there to have fun! We enjoyed the lounging in the sun, sipping cocktails and cooling off in the pool while admiring the surrounding mountains and the towering Grand Sierra Resort hotel. Later than evening we headed to the casino for dinner a bit of gambling. Nick doesn’t really love to gamble, so he checked out the sports-book area, restaurants and bars while I played blackjack. We left the Casino with almost as much money as we entered with, and feeling like we’d just taken a vacation. The next morning we were on the road again and headed to Winnemucca, Nevada. We were officially in the high desert where the summer days are hot and the nights are cool. Once again we stayed at a casino campground, but we definitely weren’t in Reno anymore! Winnemucca is a very small town with a cowboy feel. 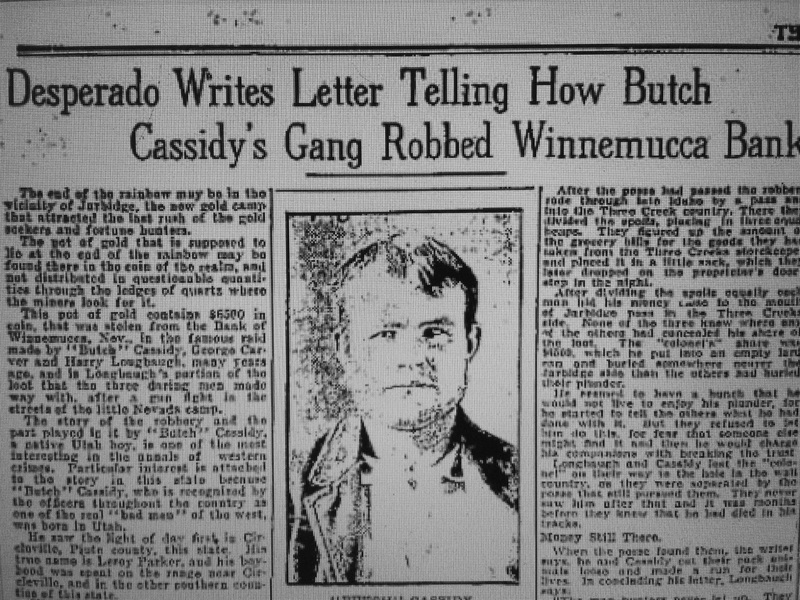 According to history, on September 19, 1900, the First National Bank of Winnemucca was robbed by Butch Cassidy and the Sundance Kid. The thieves were never caught and got away with $32,640. Current historians doubt it was really Butch Cassidy and his gang, but believe it was an inside job to cover-up accounting shenanigans by the bank owner. The casino and campground in Winnemucca were small. But there were plenty of trees, a pool, and a big empty gravel parking lot where Bella could play off leash. NIck and I took a swim to cool off. There was no pool-side bar or party music here! But we enjoyed having the pool to ourselves. After dinner we went into the tiny casino. The folks were all local and mostly regulars. I lost a little at the only blackjack table they had, we talked with some of the locals and took the short walk back to our RV. 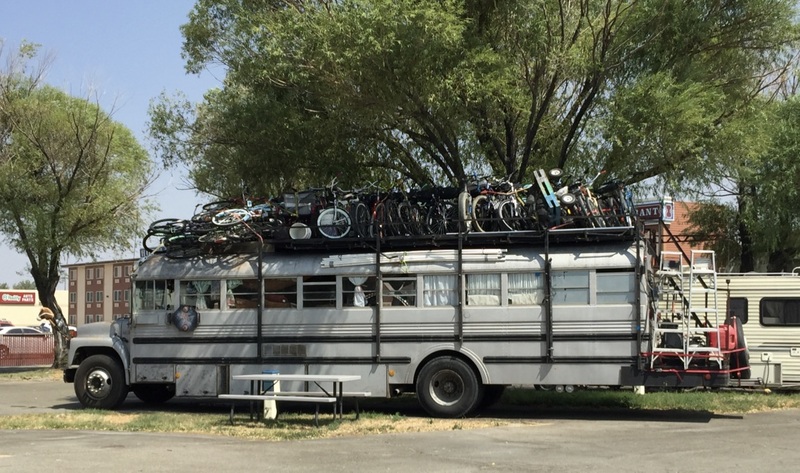 Our neighbors in Winnemucca were hauling bikes to Burning Man. They stayed just long enough to repair the bus. We got an early start the next morning for the long drive to West Wendover, Nevada. We pulled into the KOA conveniently located in downtown West Wendover, Nevada right near (you guessed it) several big casinos. 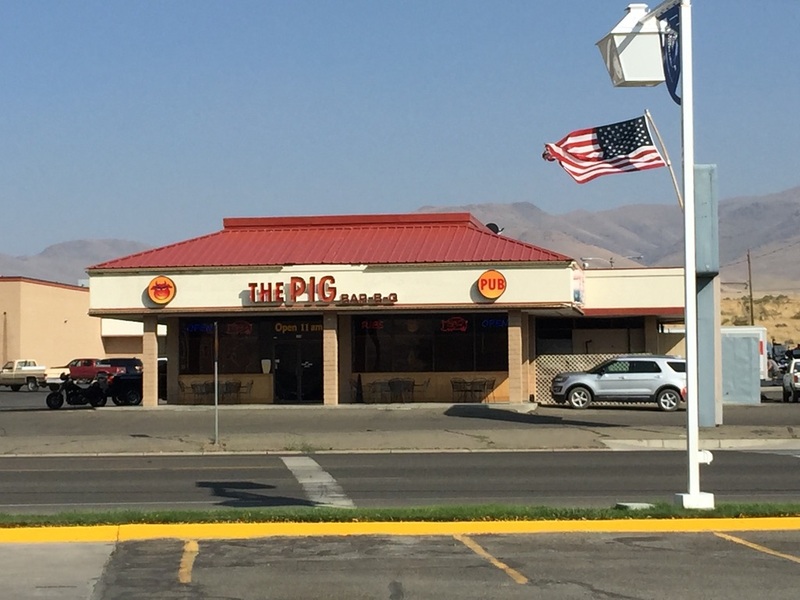 This town on the Utah border attracts lots of gamblers across the state line. Nick checked out the pool (to cold to swim in thanks to those cold high-desert nights) while I took Bella to a nearby little league field for some off-leash play time. After dinner we took a shuttle bus to one of the casino’s. By this point, even I’d had enough gambling, so I played for a just a little while and then found Nick. We walked around and had a cocktail before catching the bus back to the campground. The next morning we went to the Wendover Army Airfield. This is where the atomic bombs used in Hiroshima and Nagasaki were assembled. The Enola Gay was hangered here and the flight crew trained at this remote airfield for months before the the bombs were dropped. Now a civilian airfield, the site hosts an interesting museum. The Enola Gay hanger is being restored, but many of the other buildings from that era are falling down.The Enola Gay aircraft is in the National Air and Space museum in Washington DC. Leaving Wendover, we drove across the border and entered Utah. The landscape shimmered with salt. The sun reflecting on the salt made it look like water. I can only imagine how the pioneers felt crossing this salt desert, with the illusion of water just ahead. 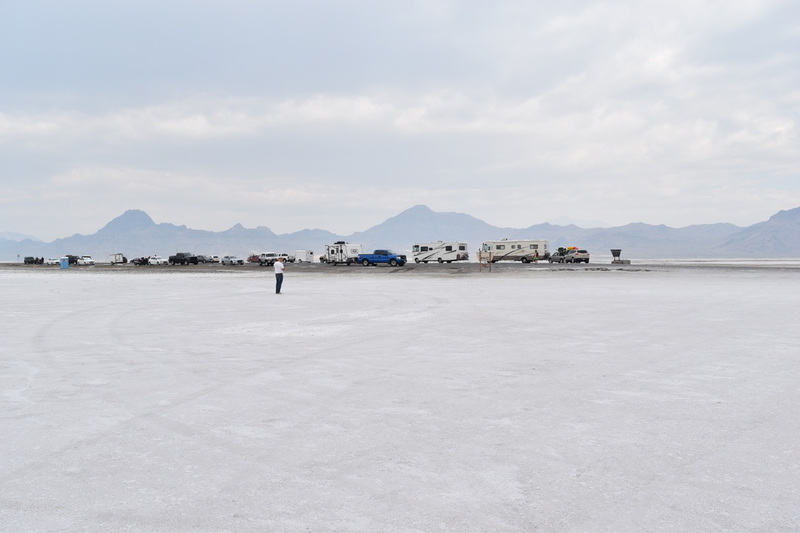 We pulled off the highway to check out the famous Bonneville Salt Flats. What a sight! The salt was so thick it looked like ice! Nick, Bella and I walked out onto the salt, in awe. It was beautiful. We left the salt flats and came upon a most unusual sculpture at the side of I-80. It’s the Metaphor: Tree of Utah sculpture, This tennis ball-topped tree is 87 feet tall and is the stuff Cattle Dogs dream of. Erected in the 1980’s by a Swedish sculptor, there is no exit ramp or parking available to pause and admire this odd sculpture. That afternoon we pulled into the Park City RV Resort in Park City, Utah. Nick was wearing his Unleashed on the World t-shirt with a picture of Bella on it. when he went into the office to check-in. The woman working behind the counter remarked that she could always find a spot for a Cattle Dog lover, because she has a Cattle Dog, too! It turns out, she’s one of Bella’s instagram followers! How random is that? We could see the Olympic ski jumps from our campsite. A sweet little creek flowed nearby with a trail small trail perfect for dog-walking. We didn’t stay in Park City long, but oh to be there during ski season. Sigh, maybe someday. Back on I-80 the next morning, we were headed northeast into Wyoming. Our cell service was getting less reliable with every mile. Nick had a surprise for me. He had found a little town called Saratoga, Wyoming. We’d be staying at Saratoga Lake and enjoying the hot springs in town. The campground was lovely. It was pretty much empty and overlooked a small lake. American Pelicans flew in and out to fish in the lake. It was idyllic. But there was absolutely no cell service. We paid for two nights and settled in. In the morning, we drove to the hot springs. The springs are operated by the town and free to use. There is a big pool (hot) and a smaller pool (hotter). The locals had also created a natural pool where the hot water from the pools spilled out into the nearby Platte River. The steps into the pools were covered with slippery algae, but the gravel bottoms were clean. The water was crystal clear and hot., with a faint sulfur smell You could see air bubbles rising to the surface of the water. In those spots, you could feel the hot spring water coming through the gravel. We went to the springs two mornings in a row There were always a few people there, but it wasn’t crowded. On the last day we met a young couple who lived nearby. She was on crutches and told us that she had been sitting in her living room about a month earlier when a bullet came through the wall and into her knee. Her neighbors were doing a little illegal target shooting and apparently missed. She came to the healing spring waters every day as part of her rehab. Saratoga, Wyoming was not the fanciest place we visited, but it was one of the nicest. We can only imagine how wonderful it would be to sit in the hot springs as the snow falls on a cold Wyoming winter day. Before we left Wyoming, we made a quick stop in Cheyenne to see the Cheyenne Frontier Days Old West Museum. We wandered the exhibits, enjoying the collections of memorabilia and artwork. The museum exhibits depicted life in the old west and the history of rodeo. I wish we could have explored more of Cheyenne, but we were anxious to keep moving East. We soon found ourselves in Nebraska and entering serious corn country. The road was lined with endless fields of corn. We stopped in a little town called Gothenberg to visit the Pony Express Museum and camp for the night. The museum was an actual Pony Express station which had been relocated to the town park. There was another museum across the street that chronicled the town’s history. Everywhere we went in town people were so friendly and nice! The homes were lovely and the lawns and gardens well-tended. There were no dandelions in Gothenburg. It was exactly how you’d imagine the ideal mid-western town. We pulled into the Lafayette Park Campground on the edge of town and were warmly welcomed by the older couple who ran it. We pulled Arvie into a pretty shaded spot under huge cottonwood trees and settled in. There was a big town park just a few yards away, across a covered bridge, where Bella was able to play frisbee and have some off-leash fun. Nick took his bike and left to scout out the town. Our campground hosts had told us that there was a high school football game scheduled for that night. In fact it was the first game of the season and against Gothenberg’s biggest rivals. That evening we climbed on our bikes and pedaled to town to see the game. Football in small town Nebraska is a BIG DEAL. It felt like everyone in town was there. As a young girl sang the national anthem, everyone stood at attention with their hats off and their hands-on their hearts. When the veterans marched the America flag down the field and raised it up the flagpole, you could have heard a pin drop. It was moving to see the patriotism and respect for the flag in this small mid-western town. We considered staying longer in Gothenberg, but our weather app forecasted several days of rain moving in, so we moved on after just one night. As we left, our camp host gave us a big hug and a jar of homemade strawberry-rhubarb jam. Guess what these are for? CORN! That was pretty much the end of the adventure. Oh, we still had a long way to go to get back to upstate New York. There was a long stretch of Nebraska to cross and and all of Iowa, Illinois and Ohio. All of these states simply covered with cornfield after cornfield. We didn’t pause in any of the hundreds of small towns that we passed by. Each day consisted of driving and camping. When we finally crossed the border into New York State we felt like we were on the home stretch. We backed Arvie into my Mom’s driveway and tumbled out onto solid ground again. Two weeks later, Nick advertised Arvie for sale on Craig’s List. Within a few days, we had a serious buyer. The night before the sale was finalized, Nick, Bella and I slept in Arvie for the last time. Watching her roll down the street with her new owner was bittersweet. Thank you and goodbye Arvie!! NIck and I continue to marvel at how much we enjoyed our RV experience. So many people that we met along the way told us that they dream of a cross country RV trip. We are grateful for that we had an opportunity to do it. P.S. Tell me about your most inspiring journey!